Today marks the official start of Hanukkah. Last year I made my first batch of latkes ever. Don't get me wrong they were delicious, but they left my house smelling deep fried. I think this year I'll head over to Brooklyn's Mile End. 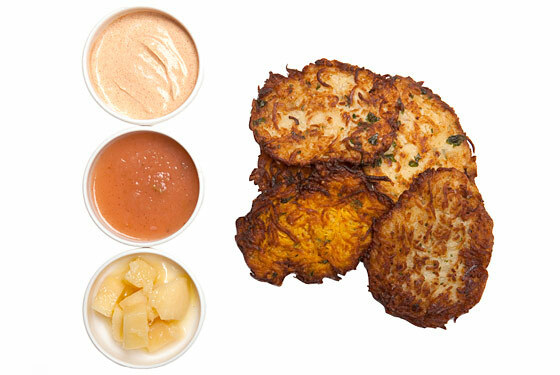 To commemorate the Festival of Lights, the restaurant will offer a nightly latke trio ($10): one Yukon-chive, one butternut squash, and one parsnip-and-celery-root, garnished with tart housemade apple sauce, sweet chunky quincesauce, and smoked-paprika sour cream. Can't wait! Ps: I am hosting a beautiful scarf GIVEAWAY later today, just in time for Christmas. Yum, I've only had them once but they are delicious!!! that sounds really good, I'd love to try this! Yum, that sounds so very good!